Mapping Google Apps domain to your website. Follow the instructions given below to add your Google Apps domain to your website created on Zoho Sites. 1. Sign into your Google Apps account from www.google.com/apps/business. 2. Once you are logged into your Google Apps account, click on 'Domains' option. 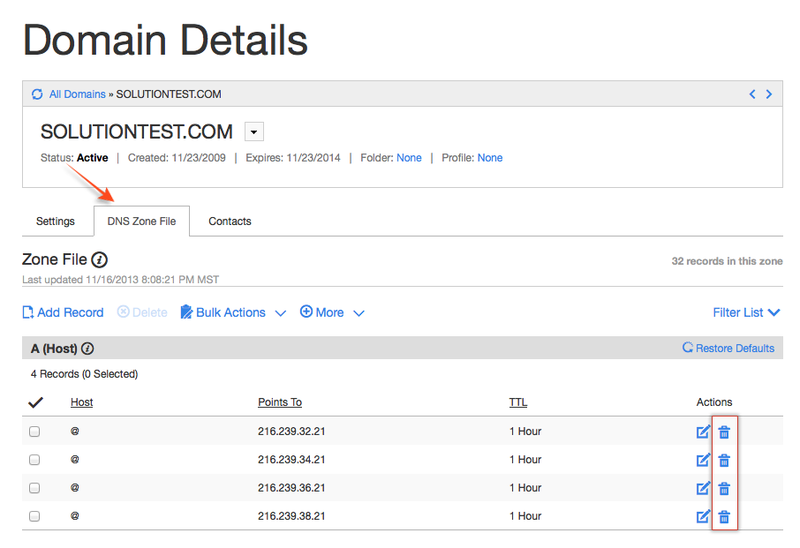 If you do not find Domains option listed in your Admin console, click on 'More Controls' and click on Domains. 3. 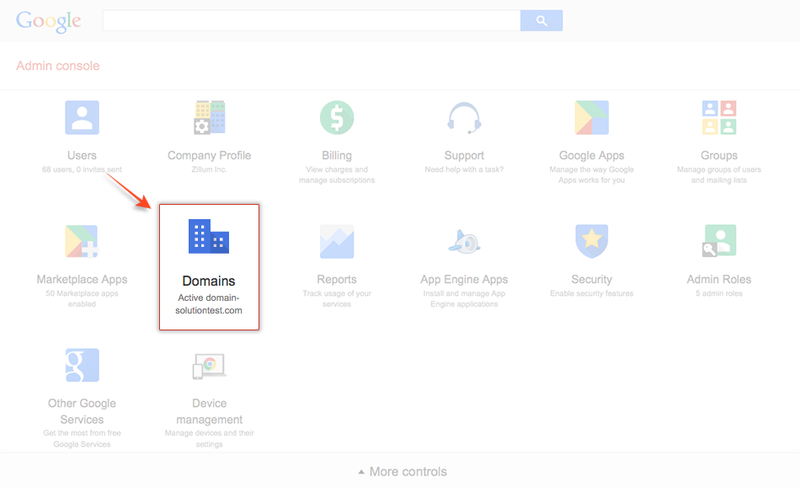 The Domains page will have the list of domains added to your Google Apps account. 4. 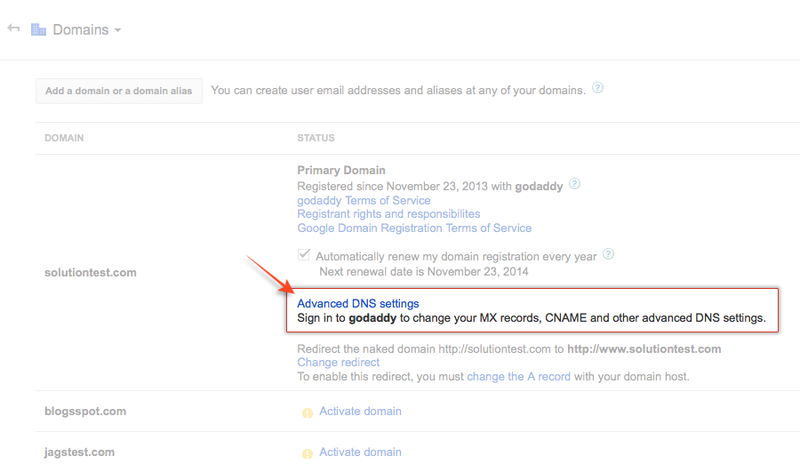 Click on 'Advanced DNS settings' option. 5. In the Advanced DNS settings page, click on 'Sign in to DNS console' link. 6. Your domain's log in page would appear in a new window. 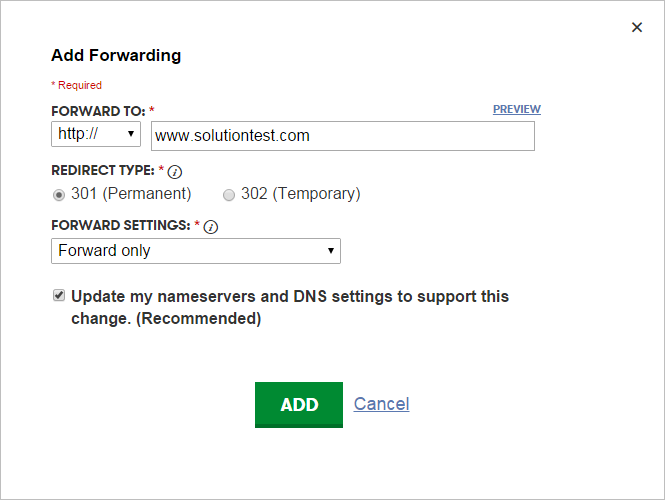 Copy paste the username and password from the Advanced DNS settings page. 7. Once you are logged into your domain console, click on your domain name. 8. 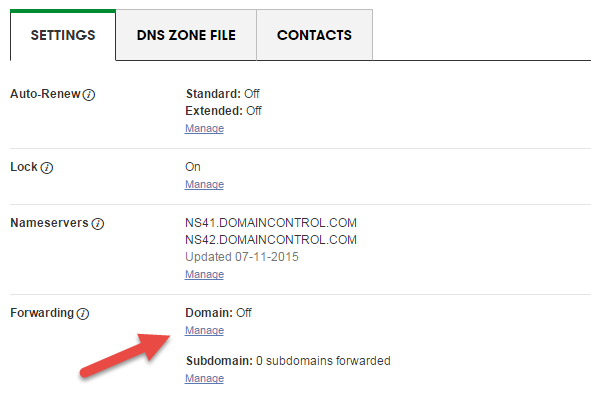 In the Domain Details page, click on the 'DNS Zone File' tab. 9. You will see a default CNAME with host name www pointing to ghs.google.com. 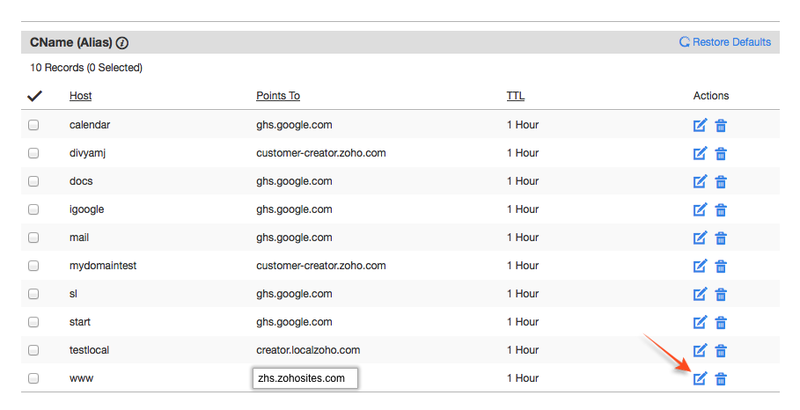 Edit this CNAME Record and point it to zhs.zohosites.com. 10. Click on 'Settings' tab, search for Forwarding option, click on the link to manage domain forwarding, and forward yourdomain.com (domain name without www) to www.yourdomain.com (domain name with www). 11. Once you have updated your domain manager with changes mentioned above, save the changes and log out of your domain control panel. Kindly note that changes done to the domain manager can take up to 72 hours to come into effect, but they typically happen much sooner. Once your domain is mapped to Zoho Sites, log into your Zoho site builder (sites.zoho.com), go to Manage > Settings > Domains, click 'Add Domain' button, choose the option to map your existing domain and add your domain to your Zoho website. When a domain is mapped to Zoho Sites and is also added to your Zoho website, users can access your Zoho site by entering your domain name.